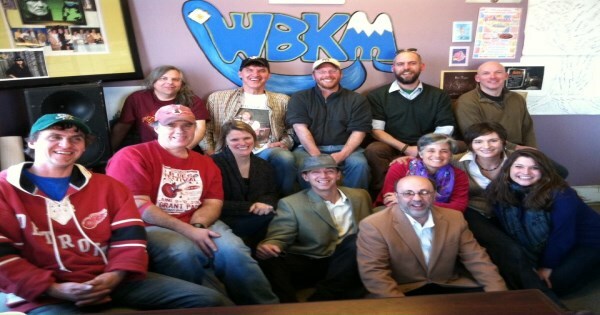 Tonight’s local music radio show on WBKM.ORG will run from 9-11pm US Eastern time Thursday March 15. You can stream it from the website or here: WBKM It will go as follows. From our small city to the great big world, these are the Sounds Of Burlington. Burlington has long had a love affair with the music of Leonard Cohen. Let’s begin with a new song written about the legend. Great song from the Siberians album Black, Blue & White. LA was recorded at Robot Dog Studio in January. Cool new song from Underground. Jeremy is so great. OK, let’s head over to Robot Dog for an interview and live performance by Bad Smell. Thanks so much Jane Boxall Percussion, Raph Worrick, and to Ryan Cohen for making us sound so great. OK, so The Tsunamibots might be turning human then back to robots on their upcoming album. Let’s take a look at their human side. Great stuff from the Luddite Bots. Cool song from Maiz Vargas Sandoval. I like to play Superstar at this time of year. Monday would have been my father’s birthday and that is one of the few pieces of music that we both loved. Here’s a cool new song. Swale will be at The Skinny Pancake Burlington on Saturday. Great songs from Joe and Gabrielle. I’ve only caught Adam once and the band is really good. This next duo are really talented. 1881 write such great pop songs. Nice jams from Binger and the MC. Ray and Russ are amazing. Here’s a cool recent song. Three of those songs are quite old and still wonderful. I’m sure the Carraway song will hold up over time too. Here’s a song that features Raph and Jane that was mentioned in the interview. Classics from Aaron and Chin. I hope to catch up with the Tory’s sometime soon. I hope you enjoyed checking out the music of our town. Let’s do it again next week, shall we? I just got back from my local music radio show on internet only Wbkm Dot Org. I played a couple of songs to celebrate my father’s 85th birthday today, and played some fun quirky songs. The ’80’s Ladies each picked a full album to play, to get ready for St Patrick’s Day, from 7-9, so the station played U2’s The Joshua Tree in it’s entirety followed by The Cure’s Disintegration. From our small city to the great big world, these are the Sounds Of Burlington. Tonight, I’m going to cheat a little and begin with a non-local song. Today is my dad’s 85th birthday, so I want to start with something he will appreciate. He’s always been a great father and spent much of his life volunteering in our community. Happy Birthday Dad! Exchange are from North Carolina, but stopped by Nectar’s on Tuesday, and played a fantastic show. I was tired, but their energy was so high that I loved every note. Homes and Phil played killer sets that night too! I know my dad has spent some time struggling with Addison county clay in his lifetime, and hope he appreciated the lyrics. I’m bummed I did not make it to Radio Bean last Saturday to see these next two bands. I just got that album yesterday and really like Dreamtime. I will have to check farther into it soon. Great songs from two great bands. There’s a Villanelles related movie happening at Arts Riot Saturday, and Maryse Smith and others are playing live. OK, last week I finished playing Many Things & Many Scenes, the excellent album from Joe Adler. Tonight, let’s start a new album to play song by song, week after week, until we’ve heard it all. Let’s jump into the first song from Swale’s The Next Instead. Rabbit are making some killer new music, but I still love that older song. Great rocker from the Crazy band who are playing all over Vermont, it seems. I loved the Sistas show with Death World Wide and ROUGH FRANCIS, and just had to play that song again. Hmmm, Swale. Here’s a fun song from an album that will be released soon. I hadn’t played ska in a while so I had to break that one out. Classics from Pinhead and Chin Ho. This next song is just one of those songs I’ve loved for years. Thanks Caroline Marie for such a great song! Those were just three classic Burlington songs, though RT were in Boston when they wrote that song about Medford. OK, let’s play some songs to highlight Burlington’s quirky side. Toes and Shark have some delightfully quirky music. Remember when you would use a cassette to make a mixtape for the girl you liked, to find a way to connect? I’m not sure how it works in the digital age, but it’s a powerful enough memory that SV and HP have released their newest albums on cassette. OK, at this point I’m long on songs and short on time, so let’s run to the end. It’s that time of year when temperatures are rising and precipitation will now come as rain. I hope you enjoyed checking out the music of our town. Let’s do it again next week, shall we?